Beyond providing data for all 32 NFL teams, PFF also supports network broadcasters with game-preview packets that are used to enhance the in-game experience for fans and viewers. This Rams-49ers preview features the same information our broadcast partners use for team research and in-game production. Jared Goff has had significantly more success on play action dropbacks than non-play action dropbacks. He averages nearly four more yards per attempt on his throws off of play action than he does without play action. 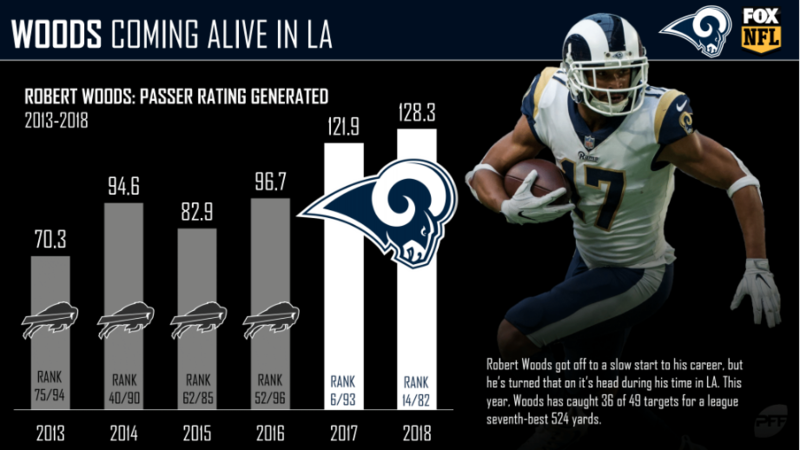 After four sub-par seasons in Buffalo, Robert Woods has found his groove in McVay’s offense in Los Angeles. 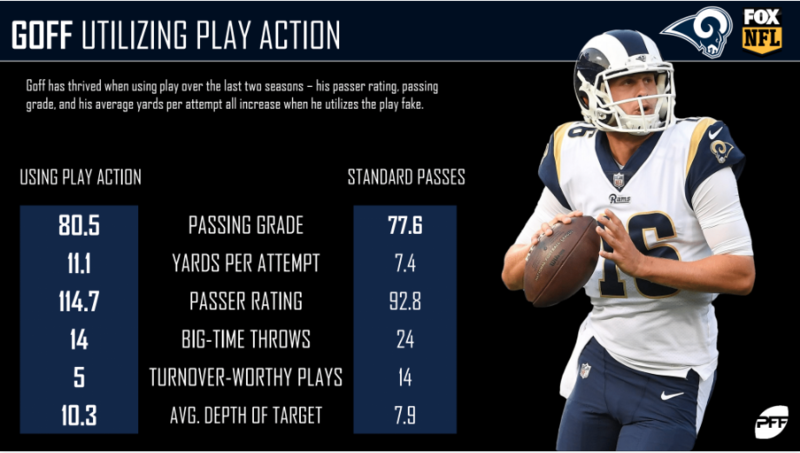 Goff has a 128.3 passer rating when targeting Woods this season, building on the 121.9 passer rating when targeting Woods last season. 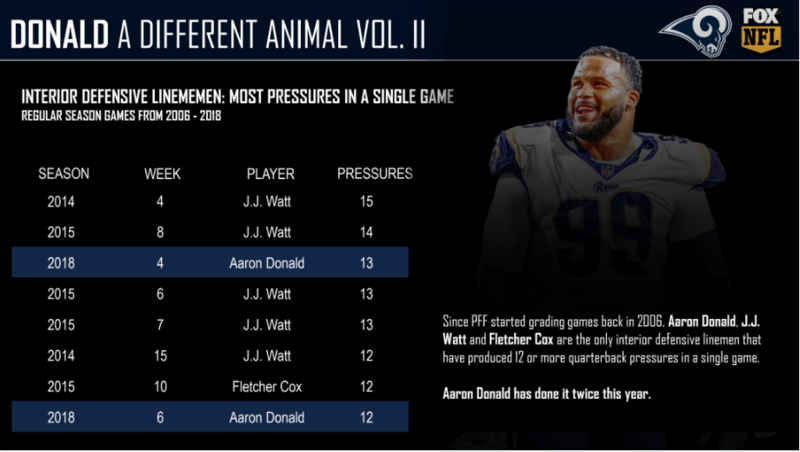 Few have come close to matching Aaron Donald‘s dominance on the interior over the last five seasons. Since 2006, only three interior defenders have recorded 12 or more pressures in a game. Last week, Donald did it for the second time this season. 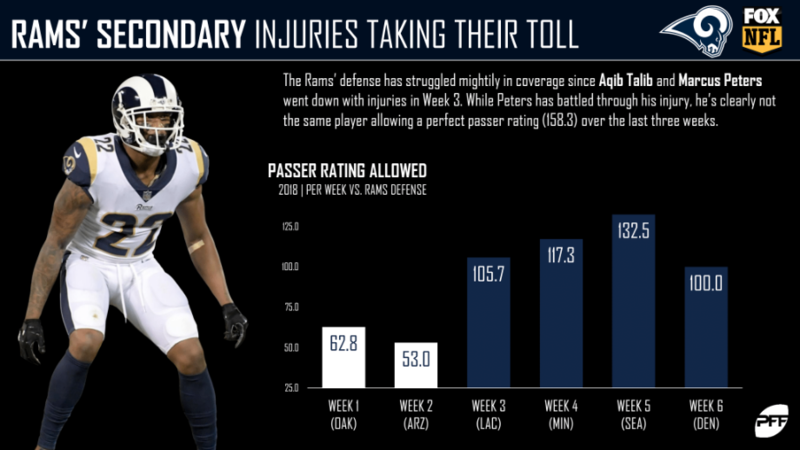 The Week 3 injuries to Aqib Talib and Marcus Peters have left the Rams secondary vulnerable. After starting the season with back-to-back games allowing a passer rating under 65.0, Peters has now allowed a passer rating of 100.0 or higher in four straight games. C.J. 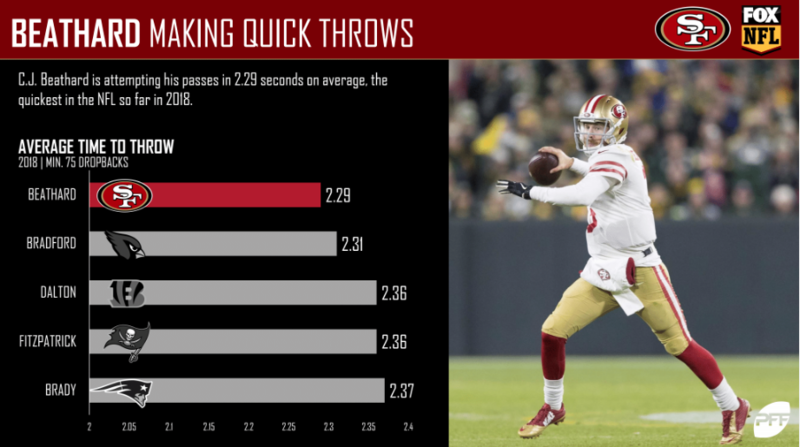 Beathard has an average snap-to-pass time of 2.29 seconds this season, the fastest in the league. Expect the quick passes to continue this week, as the 49ers attempt to slow the Rams’ formidable pass rush. 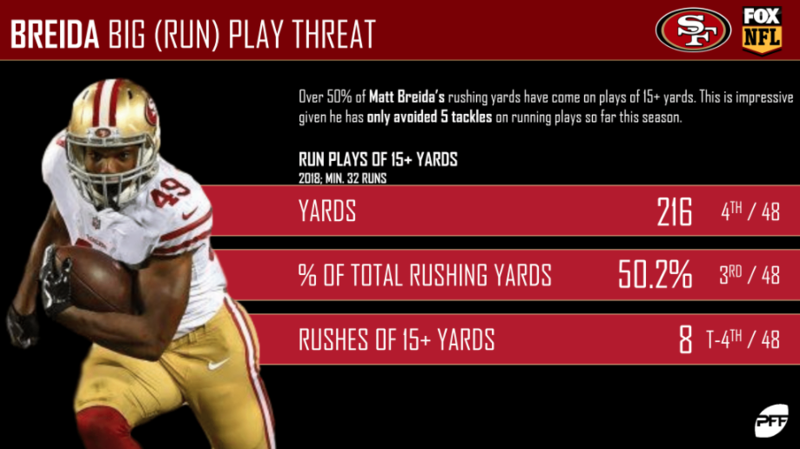 Matt Breida has been among the league’s top big-play running backs, having recorded eight rushes of 15-plus yards through six games, tied for fourth-most in the NFL. He’s sure to get his share of opportunities as the 49ers try and keep pace with the Rams’ explosive offense. 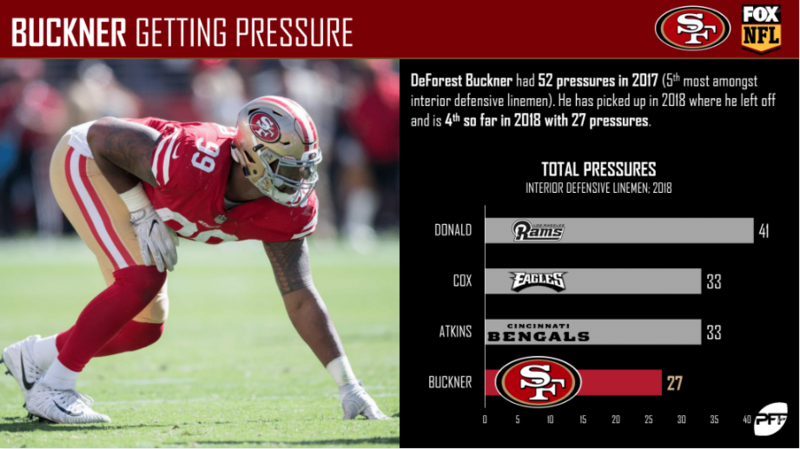 DeForest Buckner leads the 49ers pass-rush this week, as they’ll look to keep the pressure on Goff. Buckner has 27 pressures this season, fourth-most among all interior defenders. 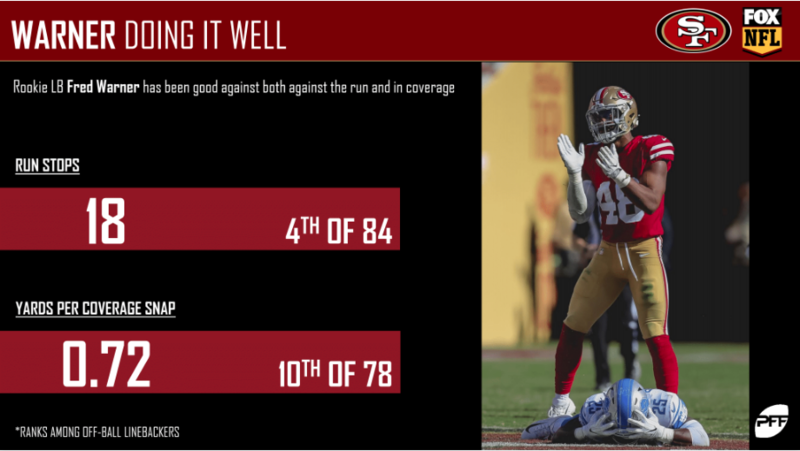 Rookie linebacker Fred Warner has been a top performer for the 49ers defense this year. He ranks fourth among linebackers in total run stops, and 10th at the position in yards allowed per coverage snap. 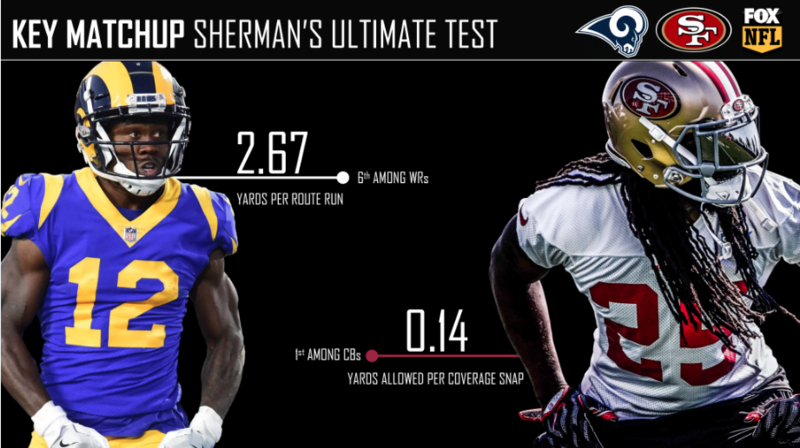 PFF Greenline has projections for the spread, moneyline and over/under of the Rams’ matchup with the 49ers. Get its picks here.